Arnab is a loud mouth aunty who would yell and yell and yell to prove his wrong point correct. Following the election results that have brought Pakistan Tehreek-e-Insaf in the lead to form government, Turkish President Recep Tayyip Erdogan has congratulated the incoming premier Imran Khan on his victory. Rajdeep deserves anything he gets but genocide against Muslims in India? Haven't followed the Imran-Musharraf relationship, but last I knew they couldn't stand each other. What changed? Former Pakistan captain Wasim Bari is hopeful that the country’s relation with India will improve with Imran Khan as its Prime Minister. Bari — who played 81 Tests and 51 ODIs for Pakistan — congratulated Pakistan Tehreek-e-Insaf (PTI) Chairman Imran Khan after his party dominated the recently concluded general elections. He added that Khan’s likeable personality will play a pivotal role in improving Indo-Pak relations. Bari also appreciated the gesture shown by PTI to invite former Indian cricketers and showbiz stars for Khan’s oath-taking ceremony. “The arrival of Khan’s friends from across the border will portray a soft image of Pakistan,” said Bari. Bari further stated that Khan will deliver in accordance with the expectations of the nation in the same manner as his illustrious cricketing career. “Everyone is aware of the fact that Khan is a man filled with confidence and I’m hopeful that he will repay the trust placed in him by the people of Pakistan, just like he did in cricket,” he said. Khan’s party emerged as the single largest in the National Assembly in the 2018 General Elections held on July 25 and is expected to be sworn in as the next Prime Minister on August 11. Belated Congrats from a life long fan. I always knew he was born with a special blessings of being an achiever - some people do get things as they command; there are talented & hard working people, but not everyone become successful. But, this I never thought I'll see in his life time - he is almost 66. In a 3rd world country with very little electoral education among majority voters and in general family/legacy dominated politics, for someone making his way up from bottom to top in 2 decades is probably unique of it's kind. Surely, surely this gentleman has to be the greatest Pakistani living - his success as PM can elevate him above even QeA MA Jinnah. I can recall sometimes in 1996, when Imran lost his first MNA election. Probably, he could have been a dummy PM long back had he sold his dignity to Gen. Musharraf, that's Imran Khan - stubborn, uncompromising, proud to the level of arrogance, but a great leader and human being - extremely gifted, hardworking, charismatic, patriotic and honest to the core. Among all his qualities, I always praised two - the greatest competitor I have ever seen in any sports filed; you can crash Imran to death, but you won't beat him till last drop of blood left and a true leader who would call a spade as spade & dice as dice, he won't be unjust to his players. Not the most naturally gifted cricket captains ever, but he knew his team, their strengths/weaknesses and how to bring best out of his players - that's the greatest quality of a motivational leader, his players would have died for him. I wish good luck to Khan and hope this brings a change to Pakistan as a nation (And, would expect better words from him for Bangladesh & it's people as PAK' PM in future). Last edited by hadi123; 3rd August 2018 at 00:49. The guy on the right of the picture is Haleem Adil Sheikh.He’s the father of a friend of mine and I’ve met him many times.He’s senior executive Vice President of PTI Sindh.He’s won a seat from PS-99 Karachi East. Really pleasant man.He’s very active in Karachi.Joined after quitting PML-Q.I hope he does good work in Karachi. He is a really active guy and gave PTI Sindh a big boost when he joined PTI i n2015 afetr leaving PMLQ. Perhaps two of the best sportsmen produced by Pakistan are sitting right there. Yep Jahangir is there in the list of top 3 greatest ever. The first time I met Imran Khan was on the field, during India’s tour of Pakistan in 1978-79. The two countries had met to play a series after 17 long years! The first things I noticed about this six-foot Pathan were his aggression, passion, commitment, and self-confidence. Not to mention his long locks and fearsome run-up. And, fearsome he was, because I got hit by a vicious bouncer from him and had to be stretchered off! It was a high-profile, sensitive series played in the shadow of the 1971 war. It was always going to be a hard-fought one, and hostilities towards us were high—from players and spectators. It was not less than a war. Imran played it hard, but I appreciate his gesture of coming over to shake hands and say “well played” after I did well in the final Test. Over the years, as we played each other more often, the relationship between the teams improved. By the time the 1982-83 series came along, both sides were more relaxed with each other. There was less sledging and aggression, and the interaction between players was cordial, as was the reception from the supporters. The more we played, the better we got to know each other, both on and off the field. I was spared much of the [earlier] hostility, mostly because I was Punjabi. The fact that my father played all of his cricket in Pakistan helped, too. I was treated differently, like I was one of them. I was never sledged or abused, but some of my teammates suffered. Knowing I came from the same background, most of the Pakistan players, Imran included, spoke to me in Punjabi. What I liked about Imran, the cricketer, was the way he led from the front. As captain, he would perform and work harder than anyone else, setting an example for the boys. Basically, he was a trendsetter for Pakistani cricket. He had a very good 1982-83 series, and his passion was there for all to see. As was mine. He and I were more or less on the same ‘war’ footing on the field. There was no compromising on the field. Off it, though, we would have friendly discussions. Rarely would we get an opportunity to meet outside a series, because we could not visit each others’ countries frequently. But, I did meet him in London in the early 1990s at a concert he had organised to raise funds for the cancer hospital he was building in memory of his mother Shaukat Khanum. That was another passion of his that he has succeeded in fulfilling. Imran was pretty much loved and liked wherever he went, not least by the Indian public. Cricket lovers enjoyed watching him in action, and could not help but admire his passion. He was very popular, especially with the ladies! I have been witness to this: whenever we were at a party, the suave Mr Khan would make a late entrance—intentionally, of course. As soon as he appeared at the door, everything would stop and the focus would shift to him. Imran is one of those guys who likes to be the “captain” and likes to control things. All his hard work in politics has paid off, and he is now going to be the prime minister. This will be one of the most challenging tests of his career. It is not as simple as dealing with 11 guys on the field. Here, there are different people and parties, different scenarios and policies. I wish him all the best. He is very passionate about his country and people, and I am sure he will do a lot of good. I am hoping his becoming the PM will be a good thing for Pakistan, and also for relations with India. I would love to see peace at the border. The challenge will be how well he tackles this issue. Last edited by Abdullah719; 4th August 2018 at 20:30. Thanks dear for describing my life time hero in suc a great way. I hope he does well for pak Bangladesh relationship. ISLAMABAD: The Indian High Commissioner Ajay Bisaria called on Pakistan Tehreek-e-Insaf chairperson Imran Khan and congratulated him on electoral success. 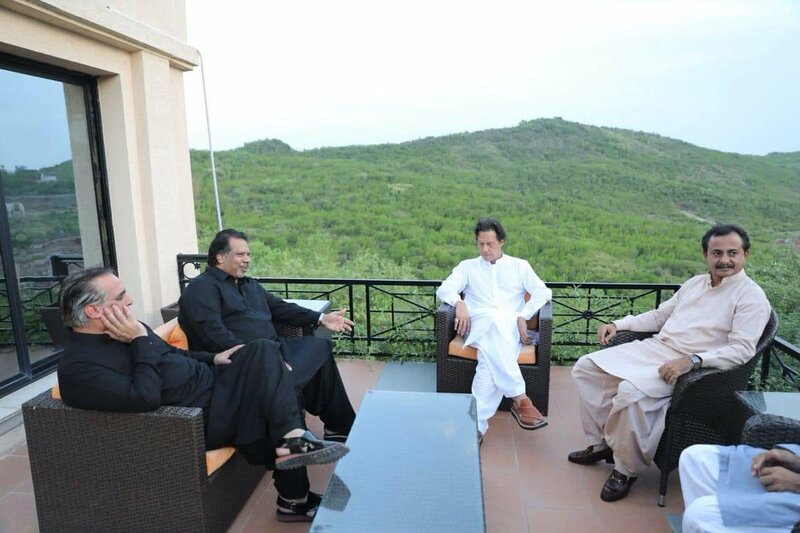 Bisari met with Imran at PTI chief's residence in Bani Gala. The two discussed a range of issues and prospects of India-Pakistan relationships. Moreover, the high commissioner also gifted a bat to Imran—who is expected to become country's next prime minister—which had been autographed by the entire Indian cricket team. Imran Khan will take oath as prime minister on August 18, Senator Faisal Javed said earlier in the day. Faisal Javed also confirmed that three former Indian cricketers Kapil Dev, Novjot Singh Sidhu, Sunil Gavaskar had been invited to Imran Khan's oath-taking ceremony. A range of dignitaries from different countries have met Imran at his residence and congratulated him on the electoral success. The acting Ambassador of the United States to Pakistan, John Hoover had also called on prime minister-in-waiting and PTI Chairman Imran Khan at latter’s Bani Gala residence in Islamabad. Imran Khan and Hoover had exchanged views on Pak-US relations and matters of mutual interest. The US envoy expressed willingness to improve relations between Pakistan and the United States. Former Pakistan Test and ODI captain Waqar Younis believes that Pakistan Tehreek-e-Insaf (PTI) chief Imran Khan and his team will do what is best for the country. Speaking to Geo News, Younis welcomed the change and expressed hopes of a better future for Pakistan. The 46-year-old said there were a lot of areas that needed improvement in cricket and other industries, and that Imran was aware of the challenges facing the sports landscape. “The good thing is Imran has played cricket and that also top-level cricket. No one is a better judge of it than him. He has been thinking about changes in the sport for a long time," said Younis. The former coach pointed out Imran had always been talking about making changes in the domestic circuit, to have fewer teams, better playing conditions, better cricket stadiums and a better standard of cricket overall. ISLAMABAD: Saudi king Salman bin Abdulaziz congratulated Pakistan Tehreek-e-Insaf Chief Imran Khan on his win in the General Election 2018, an Al-Arabiya report said on Sunday. The report said that the Saudi king, in his message, expressed good wishes for PTI Chairman Imran Khan on behalf of the Saudi government and public. The Saudi king also extended good will for the development and welfare of the people of Pakistan. Meanwhile, Saudi Crown Prince Mohammad Bin Salman also wished Imran Khan for being Pakistan’s upcoming prime minister. Saudi Ambassador to Pakistan met with Imran Khan at Bani Gala on July 27 — shortly after his party emerged victorious in the General Elections 2018.